No. 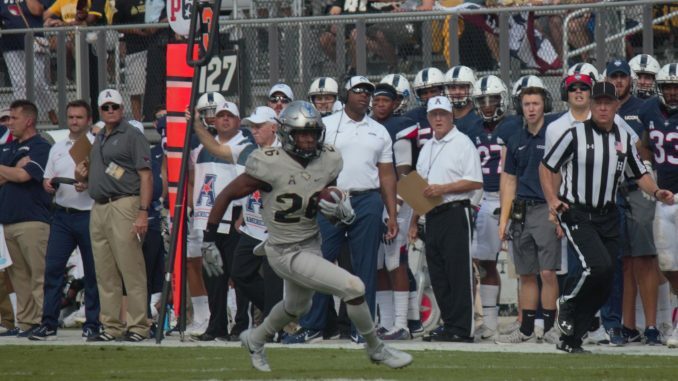 18 UCF came into Saturday afternoon’s matchup with UConn as a heavy favorite, but instead got a tough fight on its way to a 49-24 victory at Spectrum Stadium. The Knights (9-0, 6-0 AAC) blew out the Huskies (3-7, 2-5 AAC) early on. Freshman Otis Anderson and sophomore Adrian Killins got the scoring going with two early touchdown runs before sophomore McKenzie Milton connected with freshman Marlon Williams to extend the lead to 21-3 before the end of the first quarter. The six-yard score was the first of Williams’ career. UConn cut the UCF lead to 21-10 early in the second quarter, but couldn’t get enough stops throughout the day to dig out of the early hole. The Knights carried a 28-10 lead into halftime, then survived through a sloppy second half to emerge victorious. Milton bounced back from last weekend’s somewhat-shaky performance, completing 24 of his 36 passes for 311 yards and two touchdowns. On the ground, he ran for 52 yards and a touchdown. Despite a fumble in the third quarter, Anderson had the biggest day of his young career. He rushed for 84 yards and two touchdowns on nine carries. His second touchdown of the day came from 65 yards out. Redshirt junior Tre’Quan Smith led the receivers with seven catches for 120 yards and a touchdown. The Huskies put up a solid comeback effort early in the second half, but ultimately fell short. Junior David Pindell, starting in place of the injured Bryant Shirreffs, and finished the day with 201 passing yards, 96 rushing yards and three total touchdowns. UCF travels north to face Temple (5-5, 3-3 AAC) next Saturday before returning home on Black Friday for the regular season finale against USF (8-1, 4-1 AAC).